Most discussions of the transition from gasoline to electric powered cars are too black and white. The catastrophic downstream costs for our society and infrastructure (and life on Earth) of burning the rest of the fossil fuels this century are driving this transition away from gasoline (I am a climate scientist). An 80% reduction in gasoline use by automobiles can be achieved now at low cost, and is enough to put us on the right track. Remember we achieved more than 80% reduction in annual electrical use by refrigerators by mandated incremental improvements over decades, and reduced refrigerator purchase cost by 50% in constant dollars. Let me give an example from our own experience. We have driven the Prius series of cars for more than 10 years, and watched their incremental efficiency in mpg steadily increase. At the end of 2016, we bought the plug-in Prius Prime (Figure 1), and saw a huge step function increase. We were amazed that it has averaged 135 mpg on the first 21500 miles, which included several long trips - with all-round improvements in performance and no compromises. Its all-electric range is only 30 miles, but this is enough that local travel in Rutland County is mostly all electric. 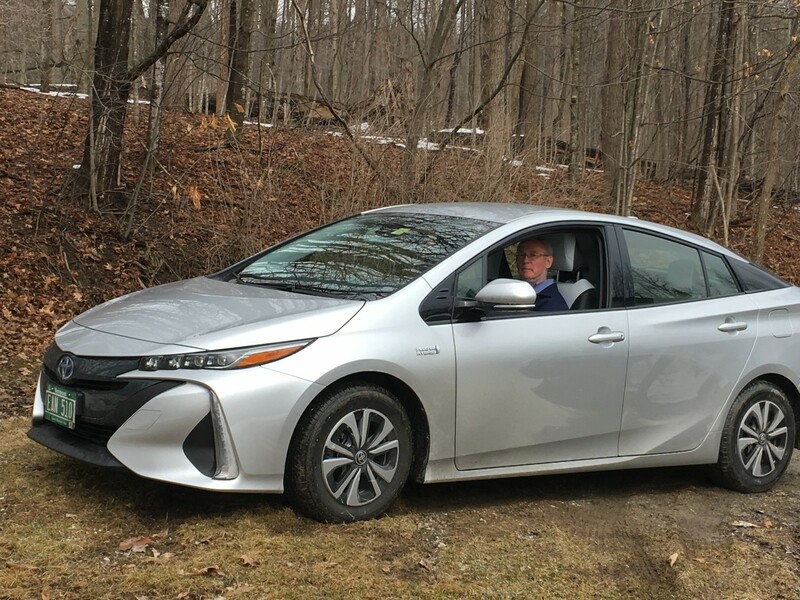 On long trips, this car quickly reverts to gas-electric hybrid mode, but with a 20% mpg gain in efficiency over earlier Prius models. The electrical power is more tightly integrated – it can run at 80 mph all electric - and the recharging with electromagnetic braking and going downhill is now a huge gain. This is now the most efficient car on the market. For example, in the warm season in all-electric mode it gets around 5.5miles per kWh, perhaps 65% more than a Tesla. Its performance on long trips illustrates this change. Early this month we toured the Canadian Atlantic provinces. We drove 2100 miles in two weeks, about 150 miles per day and averaged 82 mpg. On 10 nights, we plugged into a standard 110V socket to fully recharge, drawing 6kWh overnight. So the de-facto range on a 10 gal tank was 800 miles, plugging in once per day overnight. For reference 82 mpg is far more than the 2025 CAFE standards, which the current administration is rolling back on spurious grounds to support the oil industry. The 2017 Vermont Transportation Energy Profile Table 3.4 puts the EPA fuel economy of the Vermont fleet (including light trucks) at 22 mpg. 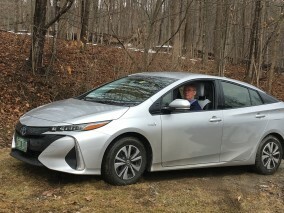 If we increase this to 27 mpg for cars, then our Prius Prime long-term fuel efficiency is 5 times that, and our long-trip efficiency is 3 times greater. I conclude that an 80% reduction in light vehicle gasoline use across the US is within present technology, and needs little investment in infrastructure. What is the electrical impact and financial cost? For our use over the first 21500 miles, I estimate our electrical consumption has increased about 100kWh per month – because many daily trips are less than 30 miles. To provide this extra power, we invested in 1kW (peak) from a Vermont community solar array, which has provided 1250 kWh per year (2-year mean), at an investment cost of $2880. Savings in gasoline consumption on 12000 miles per year (referenced to 27 mpg for the VT fleet) is 355 gals, which converts to a saving of $1000 per car per year at a gas price of $2.81 per gallon. So pay-off is 3 years (again referenced to a typical VT car), while for us it is a large tax-free return on investment for the next 20 years. None of these estimates mention the tax credit that makes plug-in hybrids currently cheap.